Check out the details on the Don't Look in the Basement collection. You can also check out both trailers below. 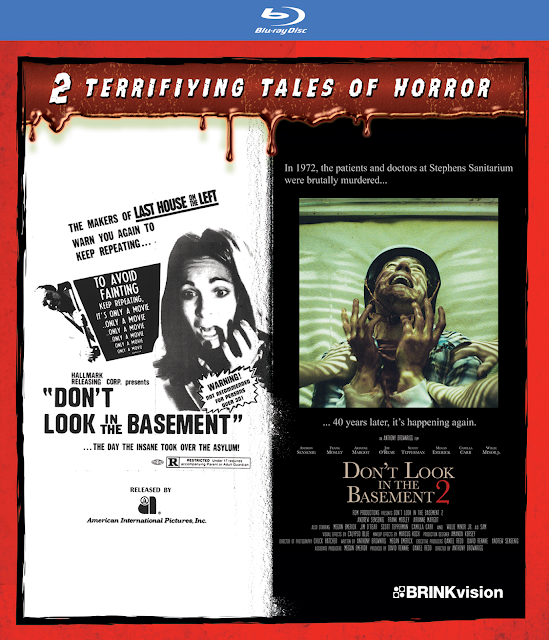 BrinkVision is releasing the Don’t Look in the Basement Collection on blu-ray July 11th. It includes for the first time in HD the original 1973 cult classic Don’t Look in the Basement and the critically acclamied sequel Both Don’t Look in the Basement 2. Nurse Charlotte Beale (Rosie Holotik) is hired by Dr. Stephens to work at a small sanitarium he runs. When Charlotte arrives, however, she learns that Stephens has died in the interim, and that she’ll be taking orders from the new president Dr. Masters (Anne MacAdams). Charlotte goes along, but can’t help noticing how unusual Masters’ approach is to treating the mentally ill. They’re allowed free run of the place, and Charlotte begins to wonder if Masters isn’t a patient herself. 40 years have passed since the massacre at Stephens Sanitarium, now called Greenpark. Its bloody history is largely unknown to its staff, not least William Matthews, a doctor newly brought in from New York. William is welcomed by fellow doctor Lucy, but receives a frosty reception from Emily, who runs the institute and assigns him his first patient, Sam. Sam survived the bloodbath all those years earlier, and seems to remember these walls all too well. His arrival awakens the building;s dark past, and blood son begins to Flow once more. Why are the patients turning on one another? What is Emily’s secret? And what really happened 40 years ago? Audio commentary by Tony Brownrigg (son of the late S.F. Brownrigg) for the original Don’t Look in the Basement, and Don’t Look in the Basement 2.